WikiPopix is dedicated to models for the population approach, i.e., models that can describe biological and physical phenomena observed in each individual and also account for inter-individual variability. WikiPopix is intended for mathematicians and statisticians interesting in modeling, and for modelers aware of the role of mathematics and statistics in models. The goal of this wiki is not to provide "recipes" for modeling or "tricks" for using software, but a rigorous approach for model implementation and practical use. It is fundamental that statisticians are satisfied with the theoretical models presented, and modelers with the tools provided. 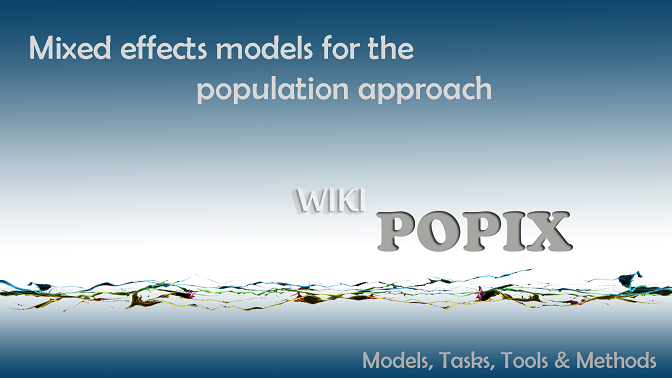 This material is intended to be used for training and education in any field where population modeling occurs. All the tools presented here are free for academic and teaching purposes. Presenting this subject in the form of a wiki has several advantages, including easy integration of multimedia applications. The goal is for the wiki to be regularly updated, corrected and improved. We are well aware that some models and tasks are missing from this first version. Any suggestions are very welcome. WikiPopix is an initiative of the Inria POPIX team led by Marc Lavielle. What is a model? A joint probability distribution! Dernière modification de cette page le 4 juin 2013 à 11:42. Cette page a été consultée 114 662 fois.